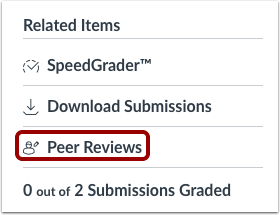 When you create a peer review assignment with automatic peer reviews, Canvas will assign peer reviews to students automatically once they have submitted their own assignment. 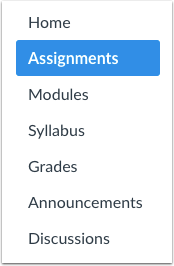 You can also tell Canvas to automatically assign peer reviews after an assignment due date has passed. On Paper and No Submission assignment types must have manually assigned peer reviews. If a student enrollment is deleted or becomes inactive, students will no longer be assigned to complete a peer review for the deleted or inactive enrollment. However, peer reviews already completed by the deleted/inactive enrollment will still display for students and instructors. If peer reviews have already been assigned, you may need to adjust assigned peer reviews. Under Related Items in the sidebar, click the Peer Reviews link. 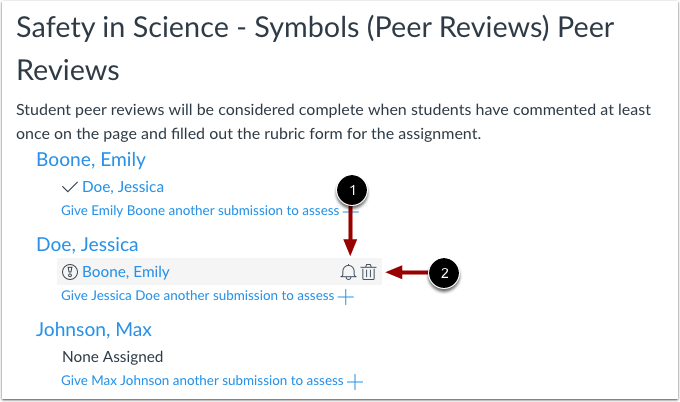 Canvas will automatically assign a peer review to the student. Assigned peer reviews appear underneath the student names. A check mark  indicates a peer review has been completed. A warning icon  indicates a peer review still needs to be completed. If the student has not submitted the assignment or submits the assignment after the due date , the student will not automatically be assigned a peer review and you must manually assign one. A student's peer review is considered complete after they comment on the submission. If a rubric has been added to the assignment, they must also fill out that rubric. You can also remind students who still need to complete their assigned peer review(s). Peer review reminders are sent as notifications. To send a reminder, hover your mouse over the assigned peer review and click the Reminder icon . To cancel a peer review, click the Delete icon . 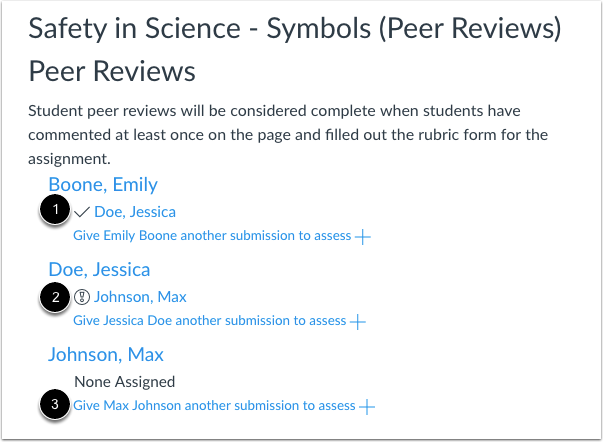 In the sidebar, you can also assign multiple peer reviews to students who have submitted their assignment but don't already have reviews assigned to them. 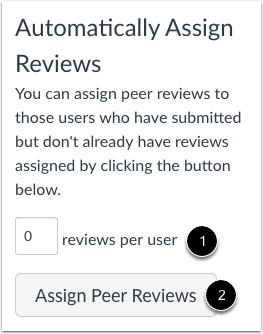 Enter the number of reviews per user  then click the Assign Peer Reviews button . 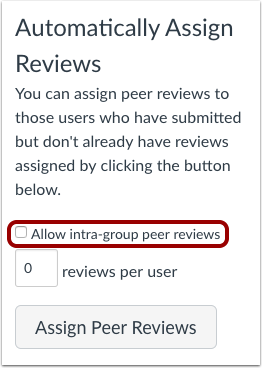 By default, the Allow intra-group peer reviews checkbox is not selected, which means Canvas will exclude members of the same group when assigning peer reviews. However, by selecting the checkbox, reviews can be assigned randomly to all members of the course, including members of the same group. To allow Canvas to automatically assign a peer review to any student in any other group, including students from within the student’s own group, select the Allow intra-group peer review checkbox. Selecting the checkbox allows assignments to be truly random and disregard group associations. Previous Topic:How do I manually assign peer reviews for an assignment? Next Topic:How do I view student peer review comments as an instructor? Table of Contents > Assignments > How do I automatically assign peer reviews for an assignment? This is the first time I work on assignment about peer reviews. I don't know how it is worked. I am confused a few things. I'm sorry about your confusion with peer reviews. It looks like you might be a student, in which case I recommend reading this guide: How do I submit a peer review to an assignment? If you still have questions, you may want to reach out to your instructor or your institution's technical support team. I hope that helps! I know it's only been a few days since Nathan's response, but I wanted to make sure we answered your questions. If you still have questions, please let us know. In the meantime, if we don't hear from you we’ll eventually archive this comment thread. We do this periodically to keep our guides updated and tidy. We’re always happy to help, though, so let us know if you have any other questions about Canvas.